The Mt Oxford Forest area contains a number of different walking and mountain biking trails. It is possible to walk to the top of Mt Oxford as a return journey, or by doing a circuit around the trails. From Oxford township take State Highway 72 west. Turn off State Highway 72, and head towards Coopers Creek. Turn right at the Mountain Road Sign and on to a dirt road. Go left at the next fork and you will find the carpark immediately afterward, with a sign describing the Mt Oxford Forest Area. This is the easiest park extrance for climbing Mt Oxford. The most direct way to the top of Mt Oxford (Route 1) starts from the Coopers Creek carpark. 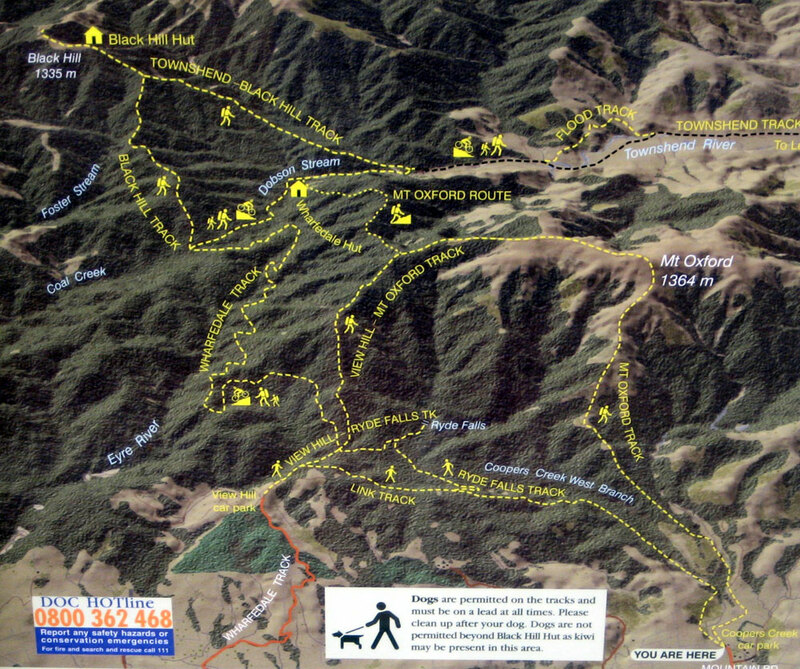 The track climbs through farmland, beech forest and snow tussock before reaching the summit of Mt Oxford (1364 m). The climb to the top should take about 4 hours. You can either return the way you came, or make a longer circuit, by walking back via Route 4. Route 4 will eventually meet with the Wharfdale Track at which point you turn left. You then pass the Ryde Falls Track and turn left at the junction after that which should take you back to Coopers Creek carpark (3.5 hours). There are many other tracks in the Mt Oxford Forest area that can be enjoyed by walkers and trampers. Other options range from 2.5 to 5 hours one way depending on the walk. The Oxford Forest DOC brochure provides an outline on more of these tracks.